A special mention should be made of Fisichella and Trulli race. Fisichella beat Alonso, and so did Trulli, but Fisichella didn't have the advantage of using Bridgestone. Ferrari makes a 1-2. This is what Michelin wanted to avoid with the ridiculous tactics last year. They weren't prepared for this race, they weren't prepared last year. To all who talked too much about last year race, today only 9 cars finished, last year all 6 cars that started finished. That's something to think about. Long live Ferrari! Michelin tyres are still not worth spit on Indy. An all red front row and a different race for Alonso, shows Ferrari would have won last year race if there had been one, but the cowards from Michelin were too afraid to lose face. After the shameful spectacle of a year ago, some people have decided we are dumb, everybody knows what happened a year ago. A tire manufacture went to Indy unprepared. With only one set of tyres that wasn't suitable for the track. When it realized its mistake, having most of the cars wearing its tyres, they decided to put pressure on the organizers: Change the rules or we don't play. They claim they wanted to race for no points, but only if the cars that buy tyres from the other manufacturer also raced for no points! How unfair is that? Let's punished the guy who came prepared for our own mistakes! To repeat that version today is really mindless. To point fingers at Ferrari or Schumacher is insulting. The only guilty party is Michelin (and they lost a very faithful client in me). Monaco is a place where pilots make a bigger difference, so it is only fitting that Alonso wins it. Montoya and Coulthard, two good drivers that lack the edge to become great, are second and third. Schumy manages fifth from the last place, the best possible result after what he did yesterday. His greatest virtue is his biggest flaw: He wants to win at any cost. Semi-typical Monaco race with big disappointments for Kimi and Klein. So, Schumacher wins the pole at Monaco in a weird way. He was first going in the last few turns when, quite coincidentally, his car couldn't turn at La Rascasse hair pin. Just by chance his car forced others to slow down, including for example Alonso who was 3 tenths faster in his last partial. This is the typical unregulated abuse that can't be avoided in Formula 1. Since the last rule chance pilots only have a few minutes to set the pole time, hence, creating an interruption in those last minutes can be highly beneficial. Now, having said that, and making clear I find this deplorable, I do not believe clothes tearing screamers, like Briatore, that are complaining about it... The reality is, they are just angry they couldn't do it themselves. Renault screws up, Ferrari wins! With this pole Schumacher breaks the tie with Sena making him the record pole setter. Button takes Pole, Ferrari screws up. The good F1 is back! Great race! Alonso finally is allowed to win a race from Schumacher. This race shows that last year was a rules fluke, but that Alonso is as good as he showed. Raikkonnen has an amazing race that we didn't see, beating Montoya who should be ashamed. Massa still has a lot to learn. 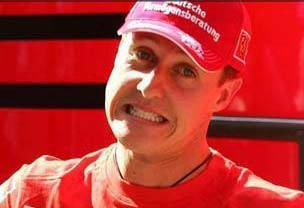 Still, Schumacher took pole (and tied Sena with 65) and has a podium to start the year. What a difference a year makes.